1. 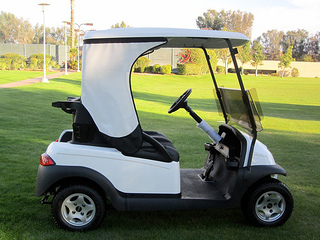 Tell us about this golf cart accessory, and what benefits does Shadys provide to a golf cart owner or frequent golfer. 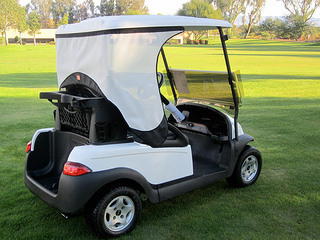 Shadys enhance the golf car driving experience by blocking 90% of harmful UV rays that can cause severe skin damage, and provides the equivalent of 90% shade to help people stay cool and comfortable. Plus, Shadys sporty design enhances the look of golf cars. Shadys also help deter light winds and light rain. 2. What is Shadys made of and does the shade interfere with visibility or being able to get in and out of the golf cart? Shadys are see-thru for clear visibility and airflow. Shadys patented concave design allows for maxium sun protection without impeding the ability to occupants to enter and exit. Shadys are made of a durable PVC coated nylon that is tear resistant, highly durable coated nylon fabrics, and military grade stitching. Shadys are very fade resistant and designed to handle the most abusive conditions without fail. 3. What golf carts does Shadys fit? 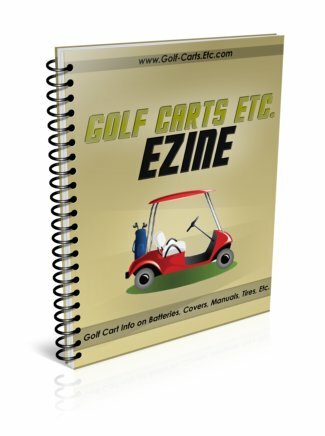 Shadys have models for almost every golf car including, Club Car Precedent, Club Car DS, EZ Go TXT, EZ Go RXV, Yamaha Drive, Tomberlin Emerge, and more. Shadys can also be modified to fit many custom canopies, but in these cases we recommend consulting your local golf car dealer. 3) Shadys Traveler that golfers can take with them when golfing at different courses. 4. How does it attach to the golf cart? Can a golf cart owner install it him/herself? Yes, golf car owners can absolutely install Shadys themselves in a matter of minutes without any permanent golf car modification required. Shadys attach with Velcro or adhesive snaps, and there is also a portable Shadys Traveler model that attaches with straps. Most installations are done by private golf car owners. 5. Tell us about the different styles and colors that are available and the approximate prices. The Shadys Ray offers three side of sun protection for the ultimate in sun protection, the Shadys Fleet and Sport offer two sides (driver & passenger)of sun protection and are designed for golf cars that have golf club rain covers attached to the back of the canopy, and the Shadys Traveler is portable so golfers can take it with them to diffrent couses. Colors include: black, white, beige, gray, brown, and stucco. Approximate pricing is $199-$235 for standard Shadys. Shadys can also be custom printed with logos, artwork, and photographs for a premium. can be easily attached to any golf cart? Yes..see answers above. 7. When the shade gets dirty can it be cleaned? Yes, with water and a mild soap. 8. Where can one buy a Shadys? Shadys can be purchased at your local golf car dealer. All Shadys have a three year warranty on stitching.